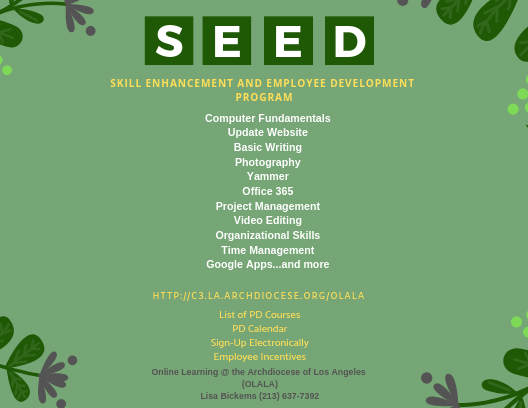 Online Learning @ the Archdiocese of Los Angeles (OLALA) would like to offer you and your team an opportunity to grow with the Skill Enhancement and Employee Development (SEED) program. This professional development program was created for employees to achieve better results and to be more productive. This will fill in the gaps which were stated in the individual ACC employee evaluation. OLALA’s goal is to develop and promote a professional learning environment where ACC employees can succeed and be productive. OLALA would also like to enhance and increase the use of our virtual community (Yammer) as a means of communication across departments. SEED takes place during work hours, like other training for ACC employees. Employees will have their lunch and then 1-hour of work release time for the training. SEED training will occur once a month with 2 open training slots on that given day. Employees can either sign-up on their own or at a manager’s request. Employees can use their work laptop or borrow one for the session. SEED is also an employee incentive program. When an employee signs-up for the first time, they will receive a SEED training card (See Below). The SEED training card will keep track of all sessions. 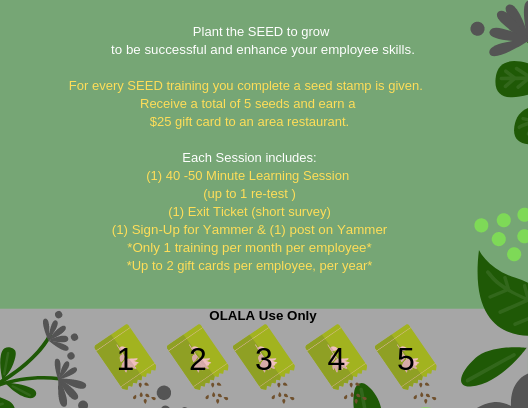 Each time an employee attends a training, they will receive a SEED stamp on the training card. Once an employee receives 5 SEED stamps, they will receive a $25 gift card from a local area restaurant. Employees can receive up to 2 gift cards per year per employee. Sign-up for Yammer & make one post. Employees can redeem their training card for a gift card. This program will develop your team to be more productive and successful. Let OLALA plant the SEED to enhance employee skills and grow a community of online learning. Plant the SEED to grow to be successful and enhance your employee skills.